No matter your industry, there’s bound to be at least one competitor that you’re always playing second fiddle. But for someone like you, a born and bred winner, constantly coming in second doesn’t sit well. Yes, there is more competition online these days, I get it, but complaining about second place will only set you further behind. Long gone are the days when you can throw up a 5-10-page website and expect the traffic to roll in, yet that’s exactly what so many businesses expect. But if that doesn’t sound like you and if you’re someone who is willing to put in the work, then this guide is for you. I’m about to give you some incredibly successful strategies to help you dominate your competition online but to excel, you need to be more strategic – it’s time to “work smarter, not (necessarily) harder” although a combination of the two can deliver a powerful KO. With a combination of brand-building and solid content, you can win in the online game. It’s simply a matter of understanding the landscape, creating a strategy, and implementing it consistently. From there, tweak as needed and continue to rinse and repeat. Too many business owners spend their time watching and worrying about what their competitors are doing, rather than focusing on what they can change and improve right now. Sure, review your competition’s marketing. But instead of worrying that they’re “getting ahead” of you, actually do something that puts you ahead. I like to use a weight-loss analogy: if you want to lose weight, you can’t just stare at the mirror or watch exercise videos – you’ve got to turn up and put the work in. It’s no different with your online presence. Not getting enough traffic? Start writing some highly valuable content that goes deep on specific topics that interest your customers. Rankings are dropping? Start reaching out to people to try and get some quality guest blog opportunities. Not getting any leads? Follow our proven conversion strategies and start converting more visitors. Most importantly, get consistent. You won’t get a six pack set of abs if you only work out once. Remaining consistent is key to putting yourself ahead. Everyone is a subject matter expert on something. Whether you’re a chiropractor or an attorney, you’ve spent years acquiring the kind of knowledge that people pay for. In today’s information-rich approach to marketing, sharing your knowledge helps set you apart and establishes you as a credible resource. But blogging doesn’t make money, right? Wrong. I’ve found that consistent and high-quality content is the key to building exponential traffic growth and driving organic sales. In fact, I’ve seen some singular blog posts drive more than $60,000 dollars or revenue to a businesses bottom line. But some business owners seem to think that a handful of 400 word blog posts is enough to set them apart. Success is not that easy. Achieving exponential growth and generating sales with content requires in-depth, valuable posts, specifically designed to attract your ideal customer. It’s even better to mix up the media. One approach that works well is creating videos and then re-purposing those videos into blog posts, audio files, and supporting images, and syndicating that information across your social media accounts for the largest reach. If you want to see an example of someone who does this well, look up Gary Vee. It doesn’t matter what platform you spend your time on, chances are you’ll find Gary because of his “be everywhere” approach. Yes, Gary is extremely prolific – and I don’t mean you have to create as much content as he does to establish yourself as an authority (especially if you’re in a local market). But my point is that it takes more than a few posts or videos, in any market, to establish yourself as an authority. Admittedly, this one might sound like I’m contradicting myself. After all, I started this post by saying not to worry about your competition. And I still mean that. However, not worrying about them doesn’t mean ignoring them. Be strategic about it. Subscription-based tools, like SEMRush and Ahrefs, allow you to review your competitors’ sites, to discover what they are ranking for and where their links are coming from. With these tools, it’s simple to export 10 competitors and to then use this information as a blueprint for your website structure, content strategy, and outreach, so you can grow your business. Think about Tesla for example, they didn’t invent the car they just massively improved on how it had been done before. You can have the same approach, use your competitors, and what’s working well for them, and then improve on it so you do it even better. The automotive industry knows that roughly 3% of people are considering a new vehicle at any given time. However, they don’t know which people these are, so they constantly advertise on tv and radio, to cast the widest net. If you start looking at cars online, you alert the digital media that you’re interested. Once this happens, those same car companies will advertise to you on Google, Facebook, and other sites you visit. They understand their customers journey, from research all the way through to the eventual sale, and they’ve structured their marketing so you’ll continue to connect with their brand. If you use the five stages of the customer’s buying cycle as a guide to your marketing, then you’ll know that first, prospects have to become aware of your product or service and how it helps them solve their big problems. Educational blog posts, emails, and videos are ideal for this. As your prospects start considering their purchases, they’re interested in case studies and webinars, for more information. Finally, they decide your product/service is right for them and they purchase. One area to apply this is within your SEO strategy. Instead of focusing on high-competition keywords, review long-tail keywords and reviews. These are the keys to attracting customers across all stages of the buying lifecycle. In 2018, a high-converting website is essential to a profitable online strategy. High-performance sites combine design, SEO, and content to make it clear who your product or service is for and how visitors can purchase it. People start their buying journey by looking for information. This means that websites with a strong content marketing strategy will attract those ideal clients to their brand more easily, because they’re offering blog posts, case studies, and more – all the information geared to answer the very questions your visitors are searching for. But what happens when the visitors arrive? It’s at that point where it’s up to you to build a website that can turn clicks into real paying customers and stand out from your competitors. In short, you have to incorporate persuasive content and a strong call to actions that drives email signups and, ultimately, sales. I’m often researching 5 – 10 brands at a single time, how will you make me choose yours? This starts with planning the purpose of your site and deciding how each element will contribute to your revenue goals. Be specific, and cut the extra crap. Don’t over complicate it or try to be too clever, just show how your brand can solve a problem and do it better than your competition. Check out proven conversion strategies here to find out more. When business owners talk about “adding SEO later,” it’s clear they don’t understand the impact SEO can have. It’s like building a house and saying you’ll add the slab later – it’s an expensive afterthought when the roof collapses. High-performing websites have SEO baked in from the start but if you’re going to outrank your competition then launching the site is only just the start. If you’re competitors are constantly outranking you then it’s likely because they are either a) spending more or b) are outworking you with a better strategy or c) using a combination of the two because they realise what it’s worth. It gets worse though, most businesses are focusing on a small number of highly competitive search terms rather than seeing the big picture. They are more concerned with links and rankings and are missing the critical content component. Remember that 95% of customers are ready to purchase, which is why targeting the most competitive terms means you’re only targeting 5% of the potential customers in your industry. Don’t just try to beat your competitors on high competition terms, beat them everywhere and make sure that the moment someone starts showing interest then your content becomes a magnet to your brand. Every business has key differences. Don’t try to do and say the same things your competitors are doing and saying. Your customers will see through that, and it’s already been done. Instead, find all of the areas where your business can outperform your competitor’s, and highlight those to your visitors. Who do you serve? i.e. it’s not everyone. What are your unique benefits? i.e steer clear of “we are the best” and generic fluffy statements. What are the key features of your products and services? i.e onsite in 60 minutes, pay in three instalments, no lock in contracts. Remember you want to reach wide, cast the widest net so to speak, but then target narrow. Struggling to know who to target? Every business has that one stand out customer, they value you and the work you do for them and they will pay you accordingly because they trust you and know the outcome will be exactly what they wanted. What are their interests / hobbies? How much money does their business make? Are they technical or business minded? What are big pain points right now? When you narrow in on your specific target customer (maybe you have a few) you can easily stand out from your competitors. Find what makes you unique, and make it a cornerstone of your business, so that all of your marketing stems from it. Does It All Sound Overwhelming? So, what does all of this mean for you? It means that now, you’ve got a solid six ways to stand out in the online marketplace. The question is will you actually implement it? As you now know, in order to implement these strategies successfully it’s likely you’ll need some proven help or a lot of your own time. I’m going to take a guess and say that you’re incredibly time poor, you don’t have time and you’re too busy running your business, and keeping existing customers happy, to be able to implement them successfully. Besides, even if I teach you Kung Fu it doesn’t mean you can jump in the ring and beat Bruce Lee. 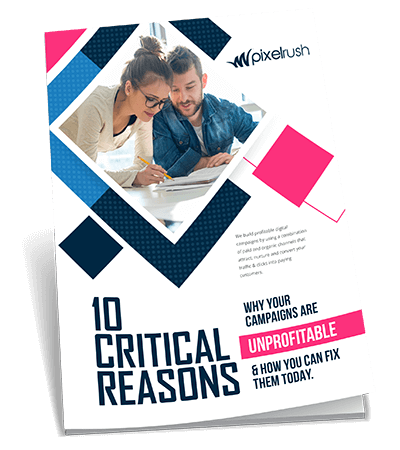 More often than not I speak with businesses who have wasted $30 – 100,000 in digital campaigns that don’t convert because they either have a poor strategy or the wrong experience assisting them. Using these exact strategies we’ve helped many of our customers leave their competitors in the dirt. If you’re tired of coming second, and watching struggling under performing campaigns, simply get in touch with me. I’ll review each of your competitors and give you the exact strategy I’ll use to bring your competitors to their knees, we’ll both giggle with satisfaction as we wave to your competitors when we pass them by.